Today, we're featuring K.M. Ecke as part of the Moral Panic blog tour, hosted by RogerCharlie. K.M. Ecke is an organic, free-range, preservative-free, philosopher-poet using universal truth to battle cultural insanity. 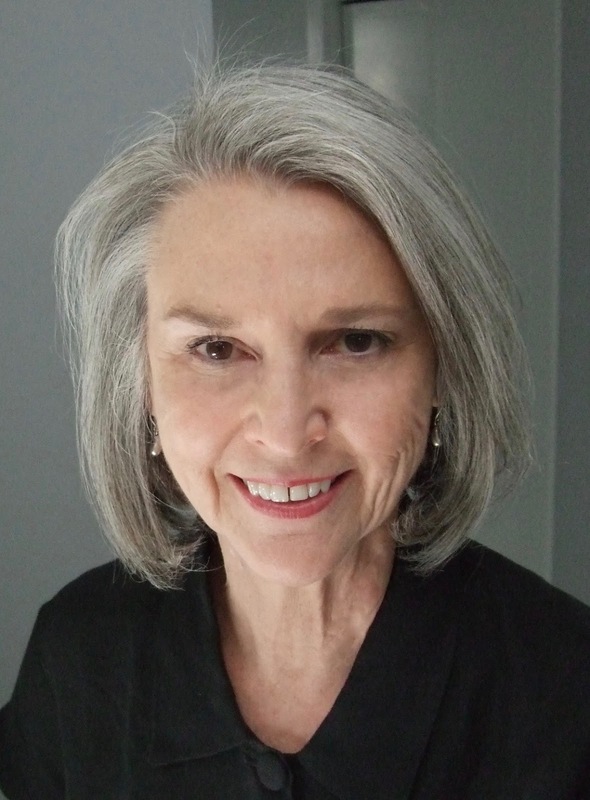 Ecke chose to pursue writing, soul-searching and creative projects. 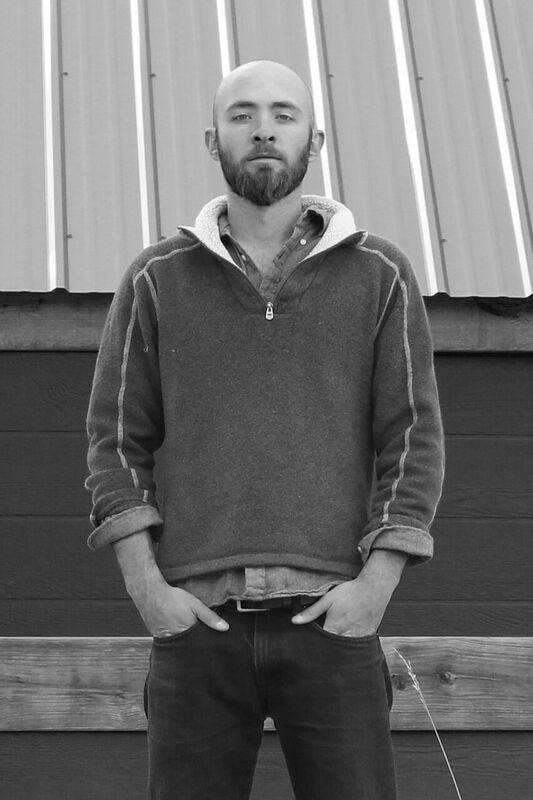 After several years of odd jobs learning about different pieces of the world, he began his own private music teaching business and attended Colorado Film School for a year and a half to study filmmaking. After 18-months in his program, he veered to his own path and established Dream Flow Media, the home to all of his creative endeavors; publishing, music and all additional branches of the many-faceted visionary. Along with his own creations, he strives to bring other artists into the fold to develop a creative collective for a variety of multimedia projects. My first reason for being in the independent publishing world is sovereignty. Whenever possible, I want control over my own destiny. I want to experience my own successes and failures. The publishing world is changing so rapidly that the big five publishers can’t adapt as quickly as a smaller player. I’d rather set sail in the storm and learn from the crashing waves than board the Titanic knowing I’m not getting a lifeboat. At least there’s honor in facing the rolling tide. The second reason is pragmatism. I honestly think it’s a better idea in the current market conditions. If I went with the old system, I’d have to send my manuscripts to dozens of agents receiving hundreds of novels every week, wait months to hear back from them (if I heard back at all), and then best-case scenario I’d get signed to a publishing deal (probably without an advance, because unless you’re already well-known with a big following they won’t give you one) where they take the majority of the revenue from my work, and completely control the amount of resources they use to promote the book. 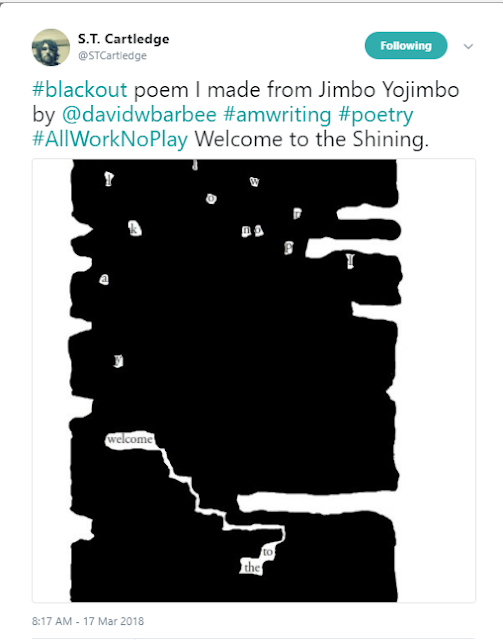 I’ve heard horror stories about authors who get signed to a publishing deal and then don’t get any support after the first sign that the novel won’t be a New York Times bestseller. 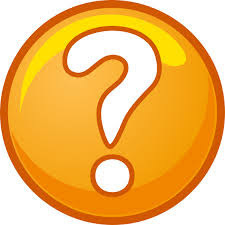 Even if I were signed to a big publishing company, let’s be honest, if they’re deciding where a better return on their investment is going to come from they’re not going to pick my book, they’ll get far more money using their resources on the next Dan Brown or Neil Gaiman book than mine. By the time I got all of that going and started making anywhere near enough money to live, I probably could have written another novel. I don’t want to stall and anxiously wait around for someone else to tell me when I’m allowed into the art form. I’d rather publish and move on to the next story, learning along the way, because then I know I’m growing on several different levels. Prolificity is more important to me than perfection. I believe the story of my novel, Moral Panic, needs to be told, and the only guaranteed way to do that is to take on all the boring publishing business stuff I don’t want to do as the burden of responsibility for living the life I want to live. I won’t have the brass ring of being a “published author” but my book is mine to shape, refine, or rework until the day I die. My third reason has to do with fulfillment. Not just happiness, fulfillment. I became self-employed three and a half years ago and that experience has afforded me the time to explore what I’ve wanted to explore. I’ve left jobs where I would have made more money to go after the self-development and potential of making either the same amount (or more) money in the long-term doing what actually interests me. They say time is money . . . and they’re wrong. Time is more valuable than money. Money is something humans create that we attribute arbitrary value to. Time is something we experience. You can recover lost money. You can’t recover lost time. I’m still relatively young. This is the time to take risks. When I was in college I thought about becoming a lawyer. It was safe and I would have been good at it, but why be a mediocre lawyer? Why be a mediocre anything? Mediocrity comes from the lack of courage to be what you are. Readers, my readers, I swear I have not forsaken you. Last year was a rough year for this blog. Many of our contributing reviewers left us to persue exciting projects of their own, and we found ourselves in the midst of an amazing opportunity to provide publicity for a handful of incredible small press authors. All of these changes, as awesome as they have been, meant less free time for reading and reviewing books here. And looking forward into 2018, it looks like we'll be up against more of the same. We'll still be featuring small press authors - it'll just be through more of the author series we host, and a lot less in the way of reviews. 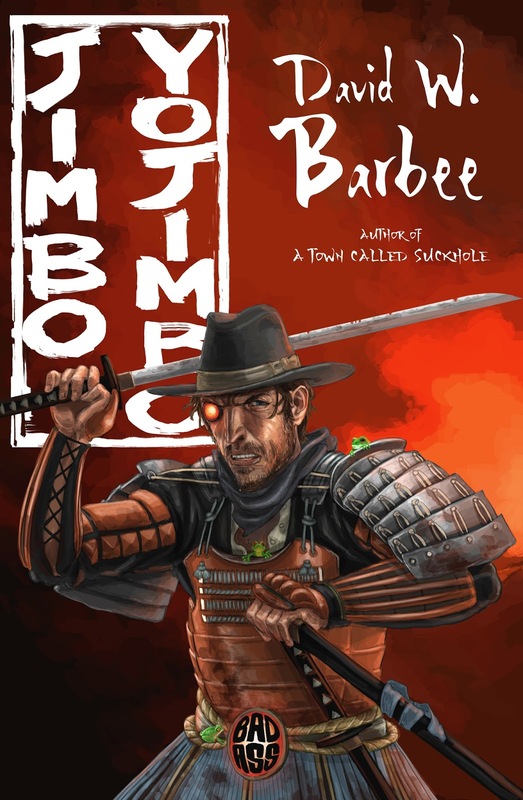 This is David Barbee's latest novel Jimbo Yojimbo. 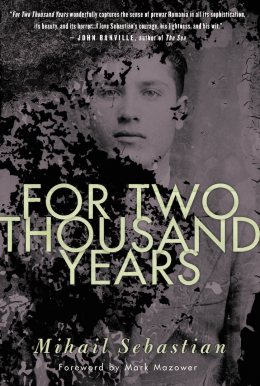 It's Eraserhead Press's first release of the year, and David and I are looking for reviewers. In this satirical, post-frog-plagued, bizarro alt-future, most of humanity has been reengineered by an evil restaurateur. Bushido Budnick is a mad master chef slash scientist of sorts, who has clawed his way to the top of the food chain, breathing life into strange (and tasty) fish and frog-like minions, who also serve as Menu Items if they fail to please their creator. 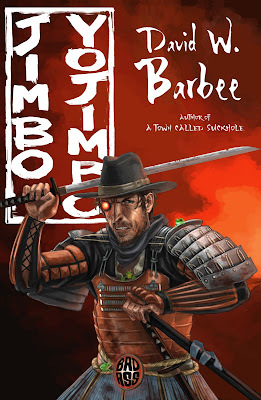 Not one to let things simmer, Barbee throws us headfirst into a dungeon cell where our hillbilly samurai hero, Jimbo Yojimbo, and his ghost daddy are making a quick escape. Jimbo's taken a revenge oath against Bushido and plans to kill him and bring his entire Buddha Gump Shrimp Company down with him. Along the way, he has to fight endless armies of crawds and Quakers, genetically enhanced crayfish and ducks, all the while trying to shake Toadlicker, Bushido's grotesquely modified superspy and right-hand-man, who's convinced himself that Jimbo Yojimbo is his ultimate match. Fans of bizarro fiction will find much to appreciate here - Barbee's imagination truly knows no bounds - while newbies to the genre, provided they are prepared to suspend reality farther than they've ever suspended it before, are guaranteed to identify with the book's underlying themes of love, loss, and an unquenchable blood thirsty vengance. Jimbo Yojimbo is an action packed, mind blowing clash of good vs evil set in a world in which the only rule is that there are no rules. If you think you might like to review this book, let us know! We have digital review copies in PDF, Mobi, and Epub. I use "but" frequently. That's because there are always so many sides to an issue and I feel a need to capture them. I'll choose the spiders! My parents were string quartet violinists and I grew up on late Beethoven. I think classical music is what keeps me alive. Besides, spiders don't attack; they just quietly climb up an down. This is tricky. I'd rather think and write in the one language I know. In fact, I can't escape it. I've already published 27 books. There are some I wish I could throw out, but it's too late. But again (all these 'but's, cf. above) there are some I believe in and would not throw out. Voice in my head, for sure. There are things I definitely do not want Twitter to know. Tissue paper. Even if it blows away, tumbling down a street. I am happy to have never had to give a reading naked. On the other hand, I have given a reading to the one person who showed up for it. Here I'll vote for the riot. Maybe someone will find something in it more alluring than a riot. I have already given up pens and paper, and I still wonder if was the wrong choice. My computer is unruly and far too complicated. I hope I never have to deal with either, but in a pinch I'll vote for the tattoo over the noise, which would make it hard to think. Well, I've already met some jerkwads. I'd choose the to meet the writer whose book I hate but whose person I respect. Awesome title, please! It's titles that sell books, not covers. The latter, although I try to make my prose as beautiful as I can. Embarrassingly truthful. I think I've already written some of those. I think I've already missed the opportunity to have a best seller that burns out but I do have hope that some of my books will reach readers after I've gone. 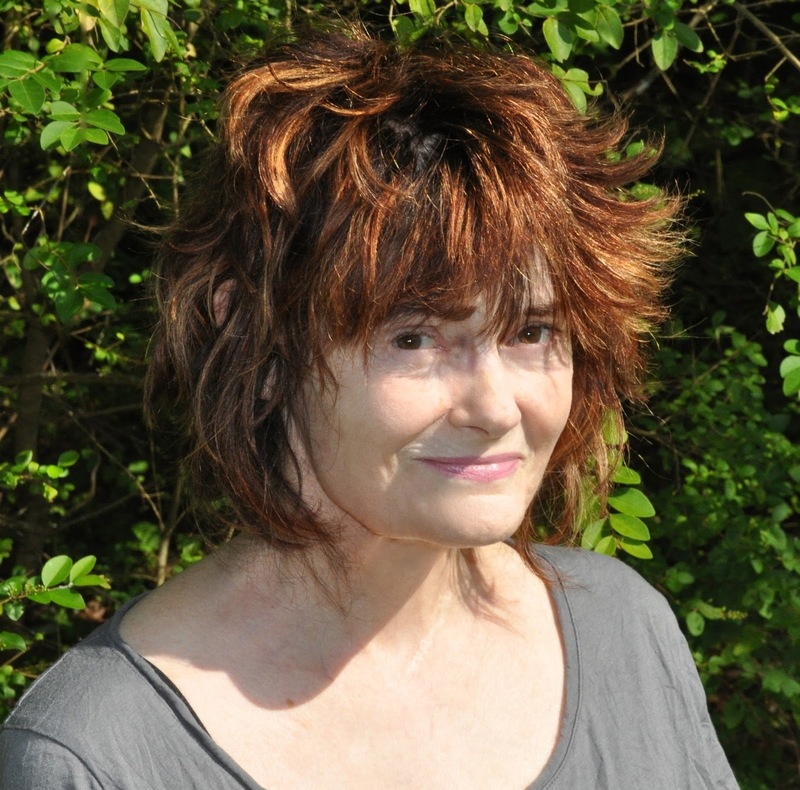 Author of 27 books, 11 chapbooks, 2 translations of classical drama. Former PL of Virginia. Emerita, Poets Corner, NYC. Hanes Poetry Prize, NEA, USIA (the Philippines), Rockefeller, Bradley Lifetime Award, Phillabaum Prize, Weinstein Award, Notable Wisconsin Author, three Arts Board fellowship grants and two New Work awards from Wisconsin, Dictionary of Literary Biography Yearbook Award (2000, for 1999), Walker Award for Lifetime Achievement in Southern Letters; four Prize anthologies. Eminent Scholar, UAH, 2001-2005. 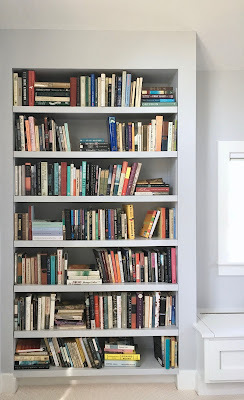 “So these’ll be gone, right?” George, the house painter, nods at the long wall in my bedroom of floor-to-ceiling shelves loaded with books. Like all avid readers and most writers, I have books in many rooms—cookbooks, in the kitchen, obviously; local history and poetry in the living room, less obviously; in my office, predictably, dictionaries, style guides, books I turn to for inspiration; in my workroom, reference books, books I mean to read, and books I’ll never read but can’t give away because of the giver; in the den, art, more art, photography, travel, history, essays, film studies; and so on. The books that really matter to me are in my bedroom. George, sizing up the job ahead, and I look at them, me with affection, George with a baffled, who-needs-books expression. I am a fiction writer. Most of the novels and short story collections that I’ve read in the last twenty-five years are here, in my most private, intimate space. No book goes on these shelves unless I read it to the end. Non-fiction I’ll read on my digital devices, but books of fiction I want to hold in my hand as objects; I want to turn their paper pages; I want to write in the margins. When I became a fiction writer, I gave up borrowing novels and story collections from the library and started buying them as a way to support living authors and the legacy of the dead, so this twenty-foot-long wall of books has become a three dimensional record of my history as a reader of fiction. Arranged in alphabetical order by author, National Book Award and Pulitzer Prize winners alongside out-of-print, mid-twentieth century British Penguins, hardbound books written by my personal favorites, cherished volumes from friends, soft with many readings, peeling pulp paperbacks with lurid covers bought secondhand. Books stacked in front of other books, groaning shelves, a twenty-foot long wall, my most personal library. I assure George, the painter, that I will deal with the books before his crew arrives. The painters were due. It was time to box up my books. I’ve done this before. I’ve boxed and moved books from college to my first apartment, which is why I still have my musty copy of English Poetry and Prose of the Romantic Movement, to my next apartment, and the next, to one fixer-upper house after another, to my current beloved cottage. Books have made the journey with me. My bedroom wall of books is personal. These are the books that have entertained me, challenged and taught me, and sustained me. But I have too many books. The shelves are double-stacked. I don’t even know what’s behind the visible rows of books. I drag out boxes, dusting rags, and the stepladder. Amis, Kingsley and Martin, Atkinson, Atwood, Austin—my eyes drift over the faded spines, past Richard Yates, and two bottom rows of Best American anthologies. Many of these familiar friends I haven’t opened in years. Do I need them any more? Which of them will I ever read again? I have so many books that I sometimes hesitate to buy new books, and so many good books are published all the time. I decide to keep only those books I truly expect to read again. Most of Kingsley Amis I save, none of Martin Amis. I keep Atkinson’s Life after Life and God in Ruins, set aside her Brodie mysteries for a mystery-loving friend, the others go in a stack for the public library’s sale. I move through the As and on to the Bs. Each decision is tough. Baxter, Berlin, keep, most of Brookner, to the library. I persist. Each book that I have loved tests my resolve, but if I figure I’m not going to read it again, out it goes onto the library pile. Soon the library pile becomes several piles. I am ruthless. My book-loving husband walks in and is shaken. Such a question is no help. If I weaken, I’m doomed. Ahead I envision a beckoning openness, not dusty yellowing volumes from the past, but a spacious and blooming future. 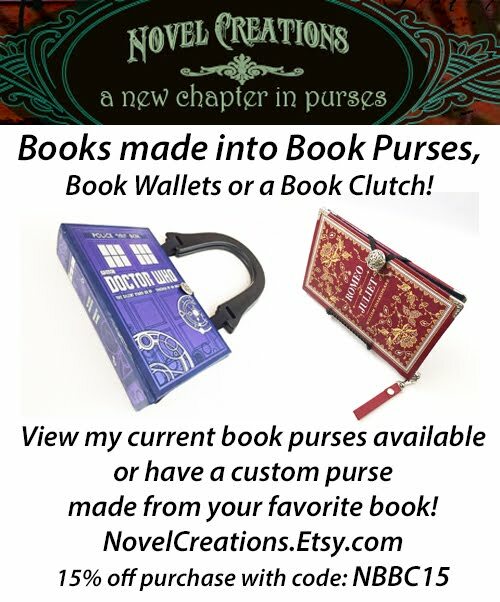 I have three hundred hardbound books and eighty-three paperbound books to give away. I am exhausted, and I am content. The painters do their work. We move back in the bed, the bedside tables, the lamps, the reading chair, but the shelves remain empty. I want them to dry thoroughly before I bring in the books. On a sunny day, I carry in the boxes and begin. I’m glad to see my old friends. Each volume seems fresh and new. Some authors’ works I place sideways so the titles can be read easily. Here and there I leave space for new acquisitions. 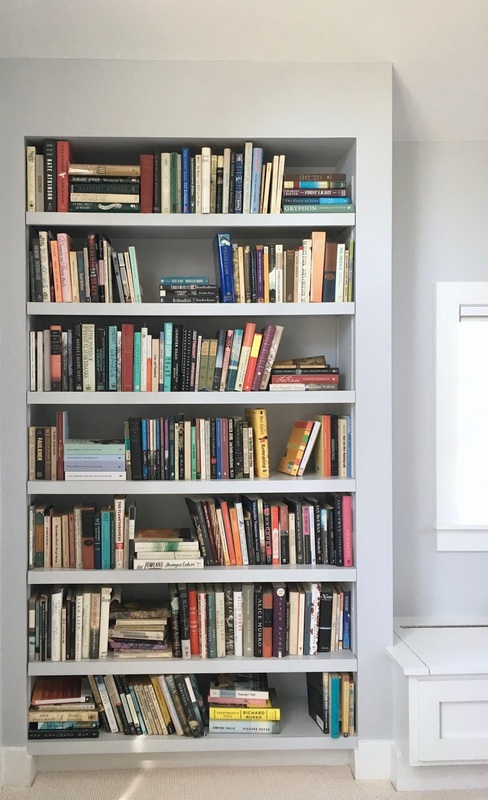 When I step back to review the result, it looks as if an interior decorator has been at work, arranging the books just so, in other words, my wall of carefully chosen books does not look like my library. What I have left is a skeleton, the remains of a formerly living organism. I try not to be disappointed. I try not to obsess over the Veronica Gengs and the Malcolm Muggeridges, the Tom Rachman, the Téa Obreht, the four hundred books I gave away. I want them all back. I avoid looking at that wall in my bedroom for weeks, until one day I need to look up a passage in Jhumpa Lahiri’s Interpreter of Maladies. Guided by my old penciled notes, I find what I’m looking for. Delighted that I’d saved this book, happy that the process of finding what I wanted was so easy, I pull down nearby books. 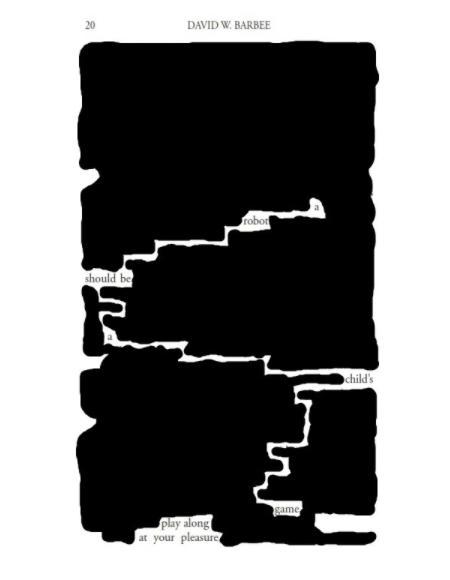 They are full of notes I’d written in the margins; inside the back cover are thoughts I’d had and connections I’d made between passages. I discover bookmarks from now-closed bookstores. I remember buying each of these books, some in distance towns, and most near home. Each book tells not just the author’s tale, but my mine too. I miss the books I gave away. I’m happy to have lots of free space on my shelves to fill with new books and new experiences, but I miss what I no longer have. It will be years before I have to face downsizing again.